I am shocked that President Trump did not overrule his Secret Service when it banned the bearing of arms in the NRA convention hall where he denounced Obama’s War on Guns. In the 1960’s Frankfurters called the IG Farben Building the “IG Hochhaus”, and i knew all about it because i had an office there. What an amazing building! Click on that link above to learn all about it. Well, almost all. I’ll add some details from my own experience. The most memorable aspect of the IG Hochhaus for many people was the paternosters. That link tells us that they got their name because the string of cars resembled the beads on a rosary, the telling of which alternated Pater Nosters and Ave Marias, but in 1964 i was told that the name came from your natural inclination to utter an Our Father before you stepped onto one of these frightening things for the first time…and perhaps a Hail Mary after you successfully exited. When i was reading links about paternosters i noticed that many of them had a reference to the thrill of riding one around the top. Well, of course. Young men are adventuresome, and curious, and you didn’t have to ride on one many times before you wondered what would happen if you failed to exit your car at the top floor. Would the thing somehow fold up and squash you flat? Would it turn upside down? Would you be dumped into a bin that was emptied every Sunday? So quite naturally the uncertainty preyed on you until finally, you were in a car by yourself as it approached the top floor, noticed that nobody was in sight on that floor, and just stayed onboard. And then were relieved that you came to no harm but moderately disappointed that the biggest thrill was being plunged into darkness for the fifteen or twenty seconds it took to transit over the top. In addition to the paternosters on every wing to move people from floor to floor, there were freight elevators large enough to move a Volkswagen. A high-tech (for 1930) feature was the central clock system in which a master mechanism regulated the time displayed in the clocks found in every office. There was also a central heating system with radiators in every office as well as a central trash chute on every floor through which trash fell to an incinerator in the basement. The windows provided excellent natural light to minimize the need for interior lighting. They did so because they filled the outer wall from side to side and from about a meter off the floor all the way to the very high ceiling. They were cleverly designed, suspended by cables that attached at the midpoint so that they could be easily flipped over to clean the outside. I’d never seen anything like this and was fascinated by them. The down side was that you had no excuse not to keep the damn things clean. The building now houses the Goethe University Frankfurt, but it had been “borrowed” by the Americans after the war and until 1995 was used to accommodate American entities, mostly military although there were CIA and other clandestine agencies in it, as well as all kinds of military intelligence and security agencies. You knew when you got to one of those areas because when you stepped off the paternoster you were met by gated steel bars and a guard with a .45 and a profound need to see the correct badge. A final stunning aspect of this building is its size. The damn thing is 250 meters long, which is approaching three football fields. I lived in a BOQ across Bremerstraße from the eastern end of it, and my office was at the very western end overlooking the botanical garden. It was a ten minute walk door to door, and six of those minutes were inside the building. What a wonderful experience to have worked in it. Ahhhh, the memories, one of ’em being having returned to Frankfurt as a civilian in 1988 and, wanting another paternoster ride, going to the building and finding a fence around it. The guard at the gate was entirely unconvinced when i brandished my passport, saying that from my office there in the sixties i’d help save the world from the Communists. 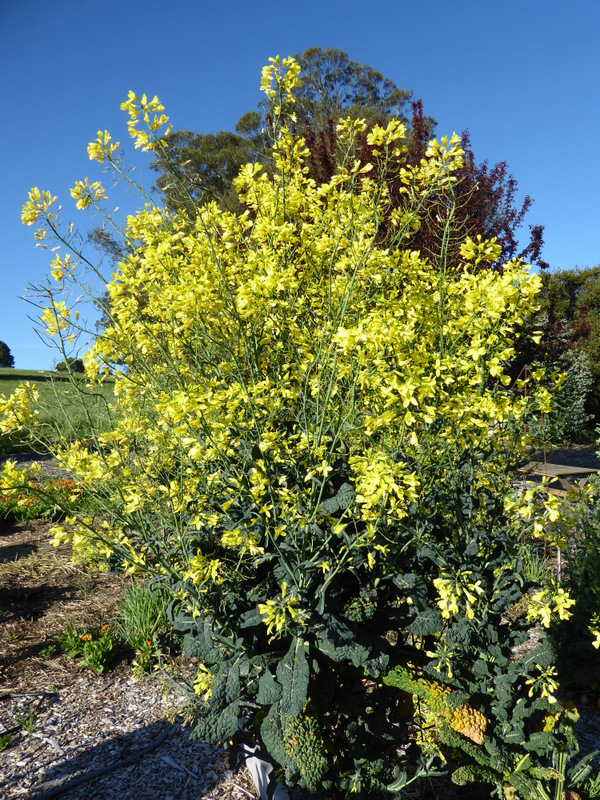 Meanwhile, since i don’t have a recent architecture pic, here’s some six foot tall kale blooming its heart out in JoAnn’s garden. The bonus is that the flowers are delicious. Interesting post on IG Hochhaus. Easy one, Scott, since i know only one man in Dublin. Glad the post was interesting. Love the flipsble windows. Wonder why that hasn’t been copied all over. I also wonder why the Paternosters weren’t and aren’t used over here. They’re great in buildings with a high volume of traffic and a limited number of stories.